I have a confession to make: I am terrible at handing back papers. That sounds silly, right? I mean, you literally just hand the paper to the kid whose name is at the top. There are the eye rolls and the whispering to each other of “What did you get?” and “She gave me a ___.” Next thing you know, the paper you spent so long reading and marking has been shoved into the abyss of the backpack or tossed carelessly in the recycle bin. Wow, glad I put so much time into that assignment, said no teacher ever. I honestly got to a point where I would just wait so long to give things back, the kids would kind of forget, and then so would I. Oops. I won’t lie: It made me angry. Not only did I feel like I had wasted my time, I felt like they just didn’t care. And then the snowball of thoughts would start: How will they survive if they don’t care about feedback? What’s going to happen in college? Or when they get jobs? Ugh! I’m done! After dealing with this for about nine years, I couldn’t take it anymore. I either had to get over it or fix it. Since I’m not usually one to give up, I set out to find a way to get my students to actually read their feedback and care less about the grade. The solution was remarkably easy and accidentally originated out of my laziness (score one for being a little lazy!). Last year, kids had turned in essays on Google Classroom, but rather than pasting a completed rubric into their essay as I usually did, I made hard copies of the rubric and wrote on them. This meant that I could return papers with comments but without grades. After collecting student papers, grade them (hard copy or electronic) as you usually would with comments on the written piece, but keep the rubric separate. Plan accordingly by creating opportunities for students to do independent or group work for a few days when it’s time to return papers to students. This is probably the most vital part of the process, because it will give you time to conference with individual students. I now incorporate these instructions into the student copy of the rubric. Below is one page of that rubric, which includes the reflection section. This step is where the magic happens. Since you’ve planned for independent work, you will have time to meet with each student individually. I do my conferences on a large whiteboard-painted table; I have found that since moving these from my desk to this table, our conferences are more productive. I’m not distracted by the stuff on my desk, kids are able to spread out (Chromebook, reflection, essay, etc. ), and as a bonus, we can use the surface of the table when we need to do some planning. These meetings don’t have to be more than a couple of minutes per student. When kids get to my table, I start with “What do you want to talk about?” and let them guide the conference. It is so cool to hear what they have to say. So many of them make comments like “I can’t believe I did <insert careless mistake>” or “I’m sorry I turned it in like this” or “I’m embarrassed; I see so many mistakes!” Or my favorite: “You specifically told us not to do this.” The level of reflection is deeper than any I’ve ever encountered. I assure them that it is fine and I don’t expect perfection, but on the inside I’m so excited that they’re seeing the things I see. Next they usually ask questions. This is exciting because some of their questions make perfect teachable moments! I have watched many students grow this year from these conversations. Take Alex, for example. He writes the wordiest sentences I’ve ever read, but he’s gotten to the point where he puts his own comments on his essay as he writes so we can discuss while he’s still in the writing stage. At least half of these are related to wordiness. I’m excited that he’s learned to identify it, if not quite how to fix it yet. Finally, I end by asking students how they graded themselves according to the rubric. I enjoy this part because more often than not, they were much harsher on themselves than I was. I then share the rubric with the grade and the rest of my general comments. For once, kids are usually happy about their grade because it was higher than they expected, contrary to the old days when they’d say “she gave me C” but they thought they deserved an A. The student must meet with me 1 to 3 times (depends on the student and the essay) before it is due. These meetings are quick “check-in” style meetings: What are you planning to do? What have you done? What questions do you have? The student must make substantial revisions, not just grammatical edits. The student must turn in the original and the updated draft on time. I like this approach. I always return papers w/ comments only. Kids must go to the gradebook portal and check their grades. I’m not a big rubric fan, unless the rubric is specific to the assignment and not generic. I teach AP Lit and find that early in the year it’s helpful to put comments on a separate page and write nothing on the essay. Kids pay a lot of attention to these comments. Also Google docs is great for interactive discussions w/ students, especially if I pose questions in the comment section. I struggle with rubrics sometimes as well. Once I started using the Two-point rubric, I became more comfortable with them. The rubric along with this system has really helped me and my kiddos. I like Docs for commenting along the way. I give kids checkpoint deadlines and give them feedback on specific parts of the essay as they go. It’s been helpful. Thanks for sharing! Thank you for this; I think it’s excellent! We do this in our math department; it really helps put the focus on the work, not the grade. In our case students receive the assessment back with comments, correct any errors, then receive the test and corrections back with the grade. Some teachers also ask students to grade themselves. Students reflect more on their work and also better understand why they earned their grade. This is so amazing! I actually did something similar in my Developmental Reading & English course but not this well developed and not with a reflection form. I absolutely plan to implement into my courses in the upcoming semesters. How long are your classes? How much time do you spend with each student per conference? How many students do you have? Can we use your template? I will be teaching Senior English next year and really want my students to learn the value of looking at comments before they head off to college. Our classes are 48 minutes. My biggest class was 28 and smallest was 23. We conference throughout the writing process, but thee reflective conferences are only 1-3 minutes. Just a quick “what did you think?” kind of conversation. When I first started this, kids handed in terrible drafts without any proofing at all, knowing they wouldnt get a grade. I ended up doing twice the work. Now I give a full grade for the draft and another for the revision. Works much better for me and they try harder. My kids still get a grade, it’s just delayed so they have to read the feedback in order to get the grade in the grade book. Then they have the opportunity to revise if they want. They also get grades for the process, so it’s not just a final grade. What kind of grades do you do for the process? We are required this year to enter 3 grades a week and it’s going to be very hard for me during the writing process I think. It often depended on the writing assignment for me. On bigger assignments, I’d have several “checkpoint” grades throughout the process. Thesis checks, a paragraph check, having your draft done check, etc. Those usually went in my smallest homework or participation grade categories. I don’t do a lot of grades, so I don’t have an exact answer–I’m sorry! Yes, 3 per week would be TOUGH! I don’t tell my students that the draft they turn in is a draft, at all. They bring their first drafts to peer review, then have 1 night to make revisions and turn in a clean, proofread essay the next day, BUT they always get 1 week to make revisions and return the essay for the possibility of earning a few more points. If they’re invested in improving their writing, they’ll do it, and if they aren’t, they can choose to keep their original grade. This is great advice!! I currently teach 5th Grade and am working on my National Boards Components 3 and 4 for the upcoming school year. Would I be able to use this for my Component 4? I know that building assessments for students need permission for copyrights. Can all teachers use this? Brilliant! I did something similar this year BUT put the grade on top. The result…I had some students tell me that they didn’t need to make any revisions because they received a high grade-UGH!!! Thanks for posting. Yes, I’ve been there. Felt your pain! 🙂 Hope it works for you! Implementing meaningful feedback is one of our school’s top priorities for the coming year. I love your approach! However, I teach 6th, 7th, and 8th graders with SLDs and/or mild cognitive impairments–using your approach “as is” will likely be overwhelming for them. Can you recommended a scaffolding approach to this? Thanks! Let me think on this a while. I’m sure there’s a way! This is great sharing. Thank you. I plan to use it in my Chinese classes. The first class I thought of was my AP Chinese, actually, I could use it in all levels too. I am a bit of concern about the independent work, what do I assign? –at the end of the year, my students were working on a Southern Gothic Literature unit. So one day I introduced the unit, and then while kids were reading A Rose for Emily, I met with some students. Another day, their groups were putting events in order and discussion, so I’d meet with a couple, take a lap around the classroom, and then meet with a couple more. The idea is that you shouldn’t have to change too much, but just plan to give essays back when you have 2-3 days where kids can be working independently or in groups with little “direct teaching” beyond maybe the first and last few minutes. I’ve been working on improving the feedback system in my classroom as well. I’ve always delayed returning the grade, yet a student this year told me that when I do that, the students still don’t read the comments, they just wait for me to post the grade. (The little angels.) So I added a step where they have to respond to questions that I ask them in my feedback. (e.g., How might changing this sentence to active voice strengthen it?) Yet, I really like your idea of them asking the questions, & especially of them thinking about their grade. Their idea of what they should get and their subsequent disappoint is so difficult to manage, and this seems to address that well. I have a question, though. In a comment above, you said they also “get grades for the process.” What do you mean? This process has really, really helped with this problem. They must reflect, they must read what I wrote, and they must grade themselves, but the kicker is that they MUST come talk to me about it! It’s hard to fake that part! Just reread your rubric and was wondering how you arrive at a grade. I was thinking of adding a point range at the top of each column and adding down. Any suggestions? I have done numbers at the top in the past. On the rubric I actually gave the grades on I think I did have numbers (I don’t have it here in front of me). Basically the column on the right = A, Middle = B, and the left = C and below, depending on how much they missed. I know it’s not super concrete, but it works for me and my students! I do something similar with my students and it works great. In addition what I do is take one of two sentences from every essay, print them on a page and give copies to the students. We correct a couple of mistakes together and then discuss what is the problem with the sentence. Students end-up labeling the mistakes with my help, for example: verb tenses, subject-verb agreement, etc. and in that way they get enough vocabulary and expressions to identify and name their own mistakes. (I teach English as a second language in Norway). This is a great idea! I do something similar with thesis sentences: we correct first drafts together so kids can get an idea of revisions they need to make. Thanks for sharing! I teach math and also use a delayed grade strategy. When I return assessments, I identify the mistakes with only limited information (i.e. Circle a missed negative, etc.). Students make corrections to their problem-solving, explain their errors and resubmit. Then they’ll get their original grade and their adjusted grade for completed corrections. This has helped to identify and correct a lot of misunderstanding in math. They have a sense of how well or how poorly they’ve done when the see the quantity of markings, but the emphasis is placed on knowing how to make the corrections, rather than passing the test. Of course, they can’t get a perfect score from corrections, so there is still incentive to study and do your best the first go around. 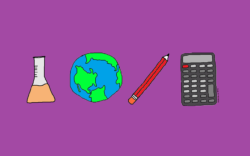 Christine – I teach 8th-grade math and I am really interested in your idea and processes. If you’re willing to share, please email me [email protected]. I like this WAY better than retake tests! Christine, what level math do you teach? I teach at a high school that has an assessment retake policy. I often feel like I’m in a never ending loop of grading. I would be interested in your ideas and how you implement them in your class. If you would be willing to pass on your ideas/insight, please contact me at [email protected]. Thanks! I did something very similar to this with my last essay this year, but I actually had students sit with me and grade their essays with me using a rubric while providing written comments. Very effective. I had more students revise than ever but still not enough. Looking forward to trying your strategy. ( All of my students are below grade level as 8th graders, so getting them motivated to work on an essay again is difficult.) Thank you for sharing. That sounds amazing! How long did it take you? I do a LOT of conferencing throughout the writing process, so we have a lot of those conversations that you probably have during this process. Very cool! I love this approach! Would you use it with timed essays, or just with process pieces? Great idea. And it works! I have two variations that I use. The first is similar to your idea but not as detailed. I will “give” them an “incomplete” in the grade book (which calculates as a zero). The assignment is returned with my comments, and students revise and resubmit. When they have revised enough (meaning that every point in the rubric is covered), they get the full number of points. The second variation has me giving a grade, and the student can get a better grade. I give feedback in Google Docs/Classroom with a grade. But–because of the rubric–the grade is usually not very good (like 20%). Students can (as with all my assignments; hey, it’s writing!) revise and resubmit for a better grade. Until they get a grade they’re happy with (and then they stop resubmitting), I comment and return. I make my own Google doc with common comments that I can copy/paste into their assignment and I add more personal ones when needed. My comments are a bit vague at first–“There are misspelled words in this essay.”–because I want them to struggle a bit, and they don’t have to struggle if I highlight something and give them the “answer.” With each resubmittal and return, my comments get more specific. I keep a Google doc with links to short YouTube videos (formatting Works Cited in Google Docs, in-text citations, thesis statement). I find they tend to watch a 2-minute video rather than read my comment, but whatever. I have gotten some push back–mostly from parents. Students quickly learn that I’m doing this differently. But they actually improve as writers because I don’t let them get away with mediocre work. And they step up their game on the next assignment because they know they have to. Kristy, I wasn’t sure how to leave my own comment, so I’m jumping on this one. I am also fascinated by Chris’ methods. I just finished my first year teaching 7/8 ELA and I really struggled with essays. What kinds of comments do you leave? What are your biggest focuses when you grade? I have tried a couple methods including attach a to-do list with the prompt and grade according to errors the students made, read through for and circle all errors and focusing solely on content. I really enjoyed reading your post, and as I’m going into my second year, I’d love to incorporate your method into my own classroom. Please let me know your thoughts, and thank you in advance! Great concept – a little like Phaedrus, but better. Thanks! It’s hard to pinpoint an exact number of pieces of work that I grade. My kids write a lot, but I don’t necessarily “grade” it all–some is for participation, some is for practice. I don’t do this process with everything, obviously, but I do it a couple times each semester. We have two semesters with two quarters in each. I have been using a similar process to yours for several years and have really appreciated the difference it makes to student focus on their writing. One more step in the revision process that I find helpful is to ask students to include a brief one-paragraph reflection about how they made their writing stronger. This helps them think about the effectiveness of their changes and also helps me understand what their goals were for the revision. Sometimes students are interested in working on a particular aspect of their writing, and it might not be what I was thinking needed the most work. I am absolutely incorporating a reflective paragraph for rewrites next year! Thank you!! What is the CSI format for writing as mentioned on the rubric? MLA guidelines are also mentioned-do you have a printout of these? I would also love to learn more about your CSI and MLA teaching processes and materials! I love this! I actually teach in higher-ed – but many of the struggles with writing are the same as K-12 (unfortunately)! We have students do professional documentation; but grading and helping them learn to reason through the process is very frustrating. I tried something similar to this, with Pass/Fail and rewrite opportunities last year. I didn’t have my process well defined and it never really drove them to think about their writing. I also have a colleague who does a huge evaluation assignment that she gives very thoughtful feedback on and feels it is a waste of time. Only a handful of students come discuss the feedback with her. I will tell her about this method. She will love it! Thanks so much for sharing this! That’s great! Thank you! 🙂 I wish there was better communication between HS and higher ed, so we could try to align some of our goals and such. I feel like I’m preparing them for college, but then I don’t really know what they are doing in college anymore! Definitely some sound pedagogical advice. I teach science, but there’s a load of literacy inherent in the subject, be it research writing or lab reports. So I try and structure my formative assessments in a way that really force the kids to understand the importance of the feedback I give them, in terms of preparing them for these summative assessments. In that sense, as they craft the formatives I am giving them constant “live” feedback: I can look at what they are doing on their Google Doc and make comments as they work. In addition, when they finish the piece, I can give them overall feedback, so they can use these to figure out where they would be in terms of meeting the standards, which are in the rubric. The formatives don’t get a grade, although I do supply a rubric so they can have an idea of where they are. So when it comes time to do the summative- in a perfect world- they can look back at the formative assessment and use this as a “guide” to how their summative should look. And when it comes time to marking the summative, I’ll go ahead and maybe write a short paragraph addressing the overall strengths and weaknesses of the piece and mark the rubric. In some cases, I won’t even give written feedback on the summative. If the rubric is written well enough – and the kids have a strong understanding of what the key verbs in the rubric entail- then that should be enough for them to self-assess, and figure out where they can improve. This is a really well thought-out process. Thanks for sharing it. I’m all for strategies to get students to read and learn from feedback, but about halfway through your post, I started to wonder why you don’t utilize the comment section in Docs and the private comment option in Google Classroom instead. I teach high school math. This past year I gave a partner project where students had to create a problem relating to a topic we were studying, and then offer a solution. I assigned the project in Classroom and students completed their work in Docs. Throughout the entire process, I was in Docs reading their work and making comments and suggestions… AS THEY WERE WORKING — not after they were already finished. Isn’t our goal to get students to produce the best quality work they possibly can? 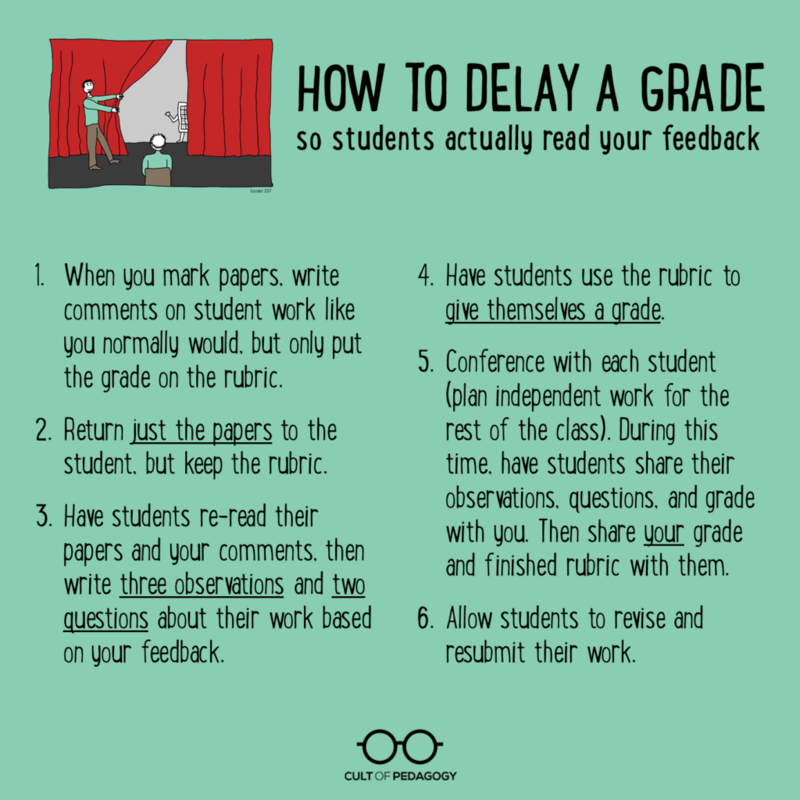 If we delay feedback until after they “finish”, they lose the opportunity to improve it (unless, of course, you allow them to turn it in again after you’ve grade it). I also use the private comment section in Classroom to generate conversations with students, similar to your one-on-one conferences. The difference is, however, that my conversations are not just limited to the 50 minutes that students are sitting in my room each day. And yes, as I mentioned later in the post, kids get the chance to rewrite after their “final” grade. I want them to grow, and if that takes a few tries then so be it. Yes, Matt, I use Screencastify to give feedback too! I’ve used it for final drafts, but I prefer it for the process more. Like you said, I feel like kids see the value during the process, but less so after the fact. It’s very frustrating! I like the idea of putting the grade in the video–that might be a good choice for some of our work. Thanks for sharing! I teach college-level students, and a few years ago I adopted the “give the grade later” method. I too loved the results. A student in a writing-intensive seminar said, “I always just flip to the back of the paper to see the grade, and then, if I look at the comments at all, I do so to see if the grade is justified. I can’t do that anymore, and it actually makes me pay attention to your comments.” On the reflection aspect of the process, just this year, I started telling my students — on the day that they had just submitted a polished paper/project — that there was one final step for them to take before I would evaluate their work, and that step was to reflect. I would email the class four simple questions that got them to reflect particularly on their writing, their use of sources, and most importantly what they had done differently in this assignment based upon the lessons they had learned from other assignments and from the feedback they had received earlier in the semester. Using this approach was quite helpful in having them take ownership for all aspects of their work, and seeing their reflection before I even looked at the papers was informative and allowed me to hone in on skills that they had indicated they were working hard to sharpen. When I did finally share the grade (a week after they received my paper feedback — so that those comments would have plenty of time to sink in), I sent the grade in an email which said, “Your paper has earned the grade of __.” To me, language matters here, and after all that they have done to reflect and to digest my feedback, they should be able to see that they have earned something, not passively received it. Thanks for sharing your process! I love this! I like the idea of having them write a reflection. I have them reflect with some specific questions, but I think I want to make it more of a little writing assignment in itself. I love the question of what specific things that you’ve learned did you use to make your paper better. Thanks for sharing! Do you think this can work for college students (English major or Teaching English major in a non-US university)? I mean, young adults do the same, they focus on the grade they got and don’t read the feedback. I always complain with fellow professors that students (in college) don’t care about improving their writing if they get a grade right away, even after one-on-one sessions discussing their writing process. Once you hand in the rubric, the interest in the assignment is gone! I’m teaching a college course on essay writing next semester and I was thinking of ditching the final essay, which never gets a re-write, and instead, I want to focus on 4 essays and their own correction report based on a reflection similar to what you present. I like this idea a lot. I’ve been struggling with many of the same things you mention in this article. Have you tried to use Kaizena? It allows students to upload an essay in Google Classroom or via Google Docs and then you can provide oral feedback directly on the essay. I tried this with one paper, and the students really liked it; if they forgot what I said during a conference, they could just ‘replay’ my comment and hear it again. I could also provide more detailed feedback while speaking rather than just writing my comments. Yes, I have used Kaizena, although more recently I’ve started using screencastify to record the screen while I give comments. I’ve found it’s simpler than the process for Kaizena as I can do it all in Canvas without having to move to other programs. I love the fact that I can explain what I mean without it taking longer! At the college level, we have the same problem with students not reading the comments, even when they are seniors. So frustrating! We have created a class to introduce writing and APA style, and I’m going to implement this with the article summaries that lead to their paper. I’m going to make them more uncomfortable by forcing them to meet with me in my office, and it’s for points. Thanks for this! This is pure genius… can’t wait to try it. I teach 6th grade English. Every year, there are always a few that just won’t do the assignment. Having a conference with every single kid, starting with those who didn’t do the writing, will also help me with the issue of those that choose the zero grade rather than write. No more zero grades because they will have to write something while with me one on one in conference. I think I will reconference with those kids after I conference with the rest. This will really give me insight into each student, and the WHY behind not turning in work. Thank you! I added this note in a private comment in Google Classroom for each student. Curious about the returns. I’d love to hear how that works for you! I feel like my kids would need more direction for the “leaving me some feedback.” I’m sure I’d get a lot of “I read your comments” as feedback! haha! What grade do you teach? When I was teaching in grad school (UC Berkeley, Political Science), I watched with horror a few times as students picked up their mid-term papers, turned to the back page, read the grade…and then *threw the paper into the trash*. It boggled my mind, mostly because I was a UC Santa Cruz undergrad back when there were no grades to be had. We pored over the comments on our papers because that was the only feedback we got. And we used to get pissed off if there weren’t many comments from the professor. It wasn’t unusual for a disgruntled student to send a paper back for a second reading because they felt a bit cheated of feedback. So my recommendation would be to eliminate grades. Can’t wait for that idea to take off. Ugh, it is SO frustrating! I always wanted to know how to get better too, but so many of these kiddos are focused on their grades (parents have a LOT to do with that, I’d argue). I can’t wait for the day we give up grades–unfortunately, our darn education system moves like a dinosaur! In your template, you mention CSI format for writing. What is this? Do you mind sharing? Thanks! I like what you did their make them read the comments until they are ready and revised. Clever. As an elective teacher I make my students write papers in another language and they often do not ready the corrections or comments. Love the idea of delaying the grade. I will try to make this work in my classroom!! I really love this tactic, especially as a creative writing student. A majority of my professors did the same thing, giving notes and then having conferences privately through the semester. I got A’s on papers throughout my primary school education but never much feedback, so getting that once college began was really nice. I definitely want to implement this tactic in my future classroom. Such a good idea for emphasizing the writing process over grades! My undergrad thesis advisor did something similar with us (throughout the process, not for the final product), and it worked really well. Do you have any advice for keeping conferences short? Hey Emily, it can be tough but I think if you give them very specific discussion points, it makes it easier. Also, I have conferences over the course of several days to give some leeway. Finally, I tell them that if they have more to discuss, they can schedule a time to meet with me before/after school or during lunch. Any ideas on how this will work with math. I’m having a hard time getting students read my feedback to them. I am currently leaving a comment in the gradebook with an incomplete marked. This isn’t really helping because they are okay with the original grade given. I love this idea and had much success delaying grade delivery at my previous HE institution. It really did encourage students to focus on the feedback. It also had the surprise result of lowering grade complaints and requests for higher marks (a common occurrence at that institution). I’m sad to say that at my current HE institution, we as faculty do not have control over anything that happens in our classrooms. The feedback and marks must be delivered via Turnitin, which is given to the students exactly 3 weeks after submission, regardless of whether the marks are completed earlier. Last term I printed off the feedback (without the marks) and gave it to the students so that we could discuss it. Students were commented on the value of this exercise, but I’ve since been told this is not allowed. Admin in HE are getting in the way of quality, evidence-based educational practices. It’s really frustrating to hear this. I’m wondering if there are any colleagues who share a similar pedagogy as you, that you could just talk to. Perhaps at some point, if a few people are interested in studying a practice, you could share this post or other research-based articles with admin, just to try to start the beginnings of a conversation. One year I simply highlighted anything I had an issue with–whether it was a simple misspelling, a word choice, or a misused fact. Students were asked to review the papers and revise…with the caveat that they were supposed to determine why I had highlighted as many issues as possible. (I also wrote positive comments in places that merited them.) Students had two weeks to conference with me and rework their papers before resubmitting. Only the resubmission received a grade. No resubmission, no grade. I tried this with some adjustment on a 7th grade science project. There are 30 students in this class (Life Science). Each class is one hour long. The students were to complete a cell cycle poster as part of a group. There were 8 groups. After the projects were completed, each student filled out a peer evaluation on their group members. I modified the rubric to fit our project. I then took a picture of each project and placed it in a Google Doc along with my feedback. This time I printed out the page, but in the future I will just share it to save resources. I gave each student their feedback and had them complete the reflection and self-evaluation. It took 2+ days to complete the conferences (they were doing online lab stations). For revisions I provided each student with a cell cycle template. It was easier and cheaper this way instead of another poster. My take-away is that the same students who blow off other options for fixing papers or test blew this off. Some didn’t turn in reflections. Some reflections were not very in depth, BUT some were amazing. I had some students offer good counterarguments with evidence for my feedback. All students seemed to look forward to the conferences. The amazing thing is that our grades were all pretty close after the students reflected on their projects. I felt it was a good experience. The revisions helped most grades and allowed students to put individual ownership on the project.